City made the trip down to cider country at the beginning of winter and it was extremely cold to say the least. I wasn't particully looking forward to the trip for several reasons, the main one being that I generally hate terracing. 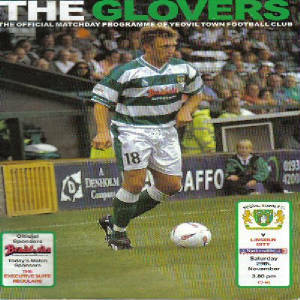 After several hours travelling, we finally got down the Yeovil and the ground feels like it's in the middle of no-where, with only several factories keeping it company. Once you're outside the turnstiles, there is virtually no-where else to go so into the ground, and after squeezing down a very narrow passageway, you finally emerge into the terrace and you're hit with an overwhelming feel of ambivalance. This is your typical south-western stadium where it's trying to be ambitious but looks a bit tacky in the end. The away terrace is a fairly average sized one but offers a great view of the near goal, however, you'll struggling getting a decent view of the other goal due to the pitch's size. 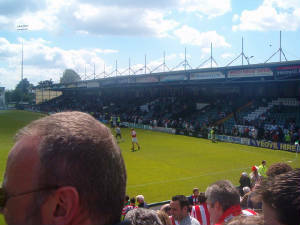 The stand behind the far goal is identical to the away end with the exception that it has a roof. The two stands either side of the away end are exactly the same, two pitch length seating areas, exact same height, exact same colour, exact same writing in the exact same places. 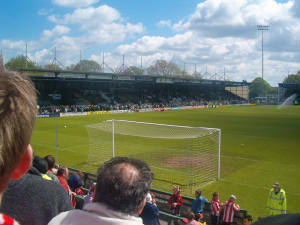 The atmosphere at Huish Park is great but isn't as great as people make it out to be. Most of the chants they sing are just the exact same one over and over again and there are plenty of other grounds I've been to that have plenty more atmosphere than Huish Park. 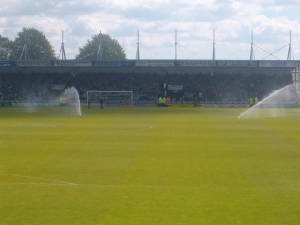 Overall, Huish Park isn't too bad but it has a massive feeling of deja-vu about it in the fact that the stands are a mirror image of themselves and the chants are extremely repeative. However, I would recommend this ground because it does have a "special" feeling to it and of course, it wouldn't have the "football feel" if it didn't have the 10,000 kids climbing up trees to try and watch the game for free.